Stop counting the reps. Start training to the beat using Zumba DVD. 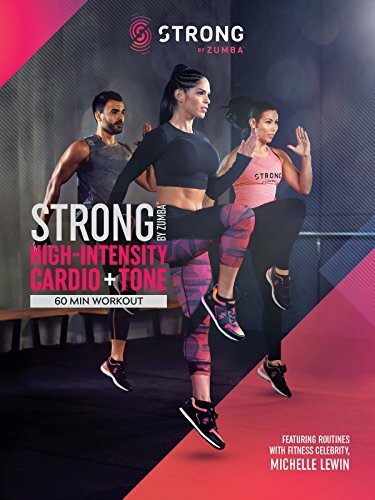 Strong by Zumba combines body weight, muscle conditioning, cardio and plyometric training moves synced to original music that has been specifically designed to match every single move. ABOUT THE DVD: No, it’s not a dance class. And it’s not just another bootcamp. Discover the STRONG by Zumba High-Intensity Cardio and Tone 60 min workout, where every move is synced to a beat. Using only your bodyweight, transform your body as muscle conditioning, cardio and plyometric moves help you burn calories and tone your abs, arms, legs and glutes. ABOUT THE LIVE CLASS: Stop counting the reps. Start training to the beat. 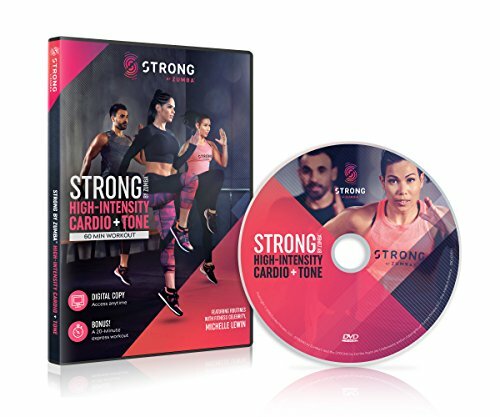 STRONG by Zumba combines body weight, muscle conditioning, cardio and plyometric training moves synced to original music that has been specifically designed to match every single move. Every squat, every lunge, every burpee is driven by the music, helping you make it to that last rep, and maybe even five more. In a one-hour class you will burn calories while toning arms, legs, abs and glutes. Plyometric or explosive moves like high knees, burpees, and jumping jacks are interchanged with isometric moves like lunges, squats, and kickboxing. STRONG by Zumba instructors change up the music and moves frequently to make sure you’re always challenged to the max. RESULTS THAT WILL GET YOU LEANER. FITTER. STRONGER. Fact: working out to perfectly synced music and moves pushes you harder to burn more calories. * Couple that with the afterburn (your body torching almost 50% more calories post-class!) and it's scientifically proven that you'll see - and feel - incredible results. ** Consistently crushing your STRONG by Zumba workouts at least 3 times per week for just 12-weeks and eating a sensible diet can result in an overall leaner, more toned body with inches lost in the waist, abs, hips, thighs, and calves. *** * Eight healthy men and women participated in the indirect measurement of caloric expenditure during STRONG by Zumba classes with and without music through the use of a metabolic cart which analyzes continuous breath-by-breath VO2 and VCO2. The results were analyzed using paired T tests. Participants burned an average of 438 calories in a STRONG by Zumba class with music and an average of 390 calories in a STRONG by Zumba class without music. Participants burned on average 48 calories more with music in a STRONG by Zumba class than without. The highest caloric count a participant burned was 680 calories. ** Eight healthy men and women participated in Post-Exercise Oxygen Consumption (EPOC) to determine their post workout caloric expenditure. Participants burned an average of 75 calories in the 40 minutes after the STRONG by Zumba class, which is almost twice the calories burned at rest. It is noted that 40 minutes post-workout, a participant's body goes back to homeostasis - a resting state. *** Twenty-three healthy study participants (20 females, 3 males) attended 60-minute STRONG by Zumba classes 3 times per week for a period of 12-weeks and ate a sensible diet. On average, the participants lost 1.39 inches in the waist, 1.88 inches in the abs, 1.67 inches in the hip, 1.68 inches in the mid-thigh, and 0.23 inches in the calves.